We love our ruffled pocket design. 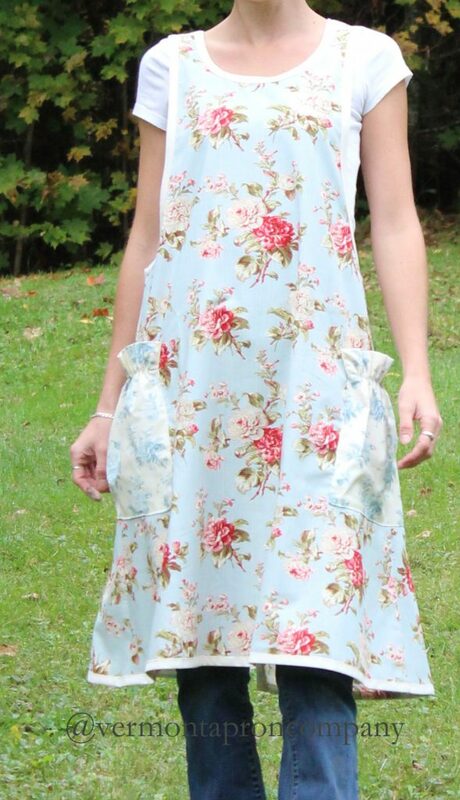 Although it’s very pretty to have a ruffle at the top of your pocket, there is a motive behind the design. Pockets take a beating from hands and items sliding in and out all day long. After a while the top edges of the pocket tend to start ripping away from the apron fabric. Our ruffled pocket is elastizied so there is a good deal of give allowing your hand to slide in and out without the seams taking the beating, instead the elastic becomes the hero saving the pocket seams and preventing holes to appear in the base fabric. This works great for prints. It even alows us a place to use a second print to contrast with the base choice of fabric. The ruffled pocket look works wonderfully. But now we have linen. Typically we craft the Hippy Apron out of linen. The Hippy Apron has a different pocket. With its pocket, we gathered and bound the top of it, and attached it to the biased drape of the apron. Somehow we didn’t think that anyone wearing the Hippy Apron would be beating the heck out of it the way they do with the No Tie Apron.We were confident as we abandoned the elastic ruffled top in this particular instance. But now we have expanded our linen collection. We have dove deep into the land of linen and its pretty colors. We are crafting out our role in this new world. 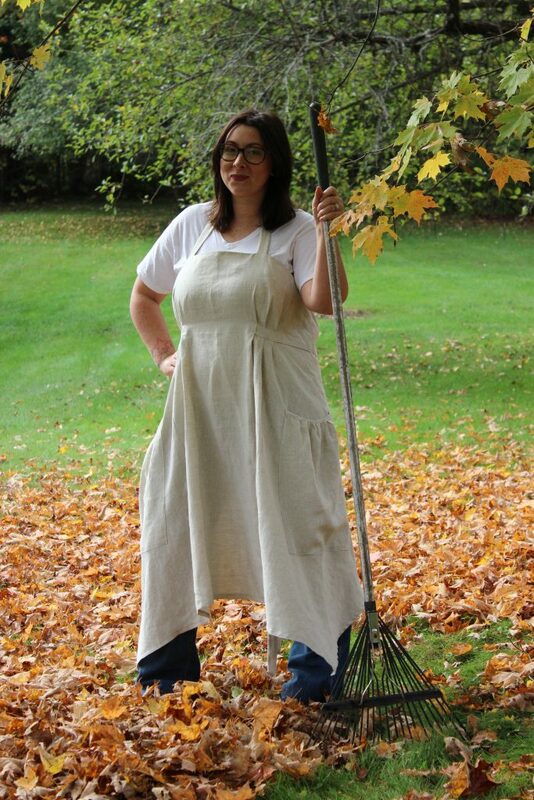 We ask the question, what does linen become to us, here at the Vermont Apron Company? It means first we need to make No Ties Aprons in all of our linen colors. Of course it does! We made the first No Tie sample in Robins Egg Blue. Its gorgeous. But we stood back, took a breath and thought……hmmmm…. doesn’t linen like the gathered top pocket better? We find ourselves stuck in the middle of the designs. The No Tie Apron is worn commonly as one does kitchen work, one works hard and the pockets take a beating. But linen flows and drapes gently around the body. It is more refined, softer and quite frankly is the Princess fabric of the kitchen. 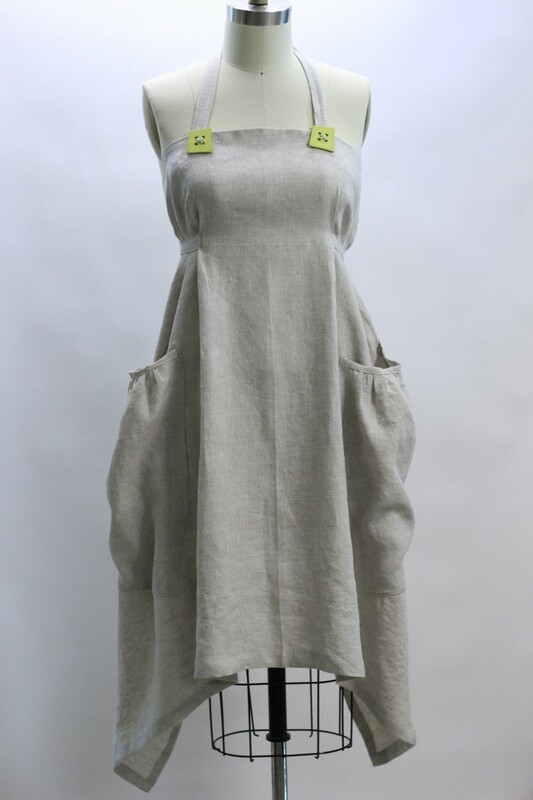 Hmmmm… we decided that the Linen No Ties Apron needs the gathered top pocket just like our Hippy Apron. It’s a lovelier marriage of pocket and apron. We summise that those linen wearers are a gentler lot when it comes to pocket use….or at least we imagine so in the fantasies of our minds. 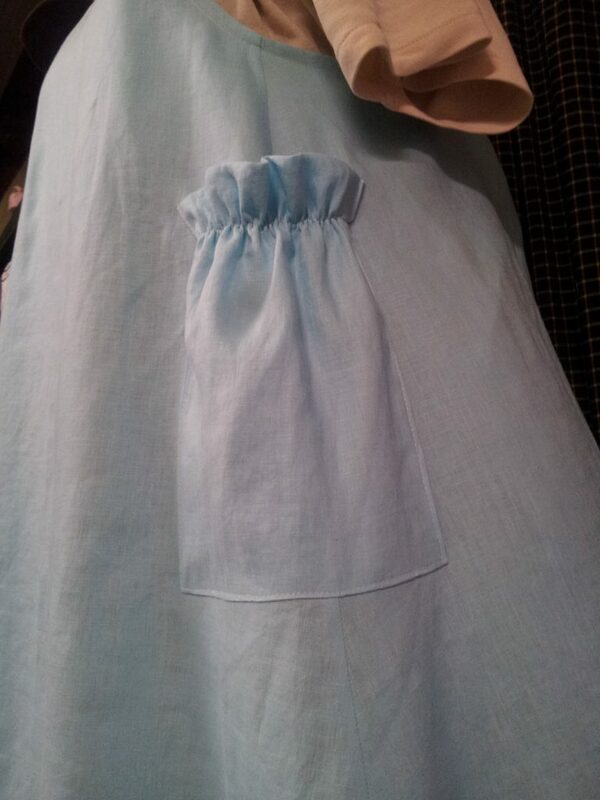 So going out on a limb here, we are committing to gathered top pockets for all linen aprons. It seems a more likely marriage of refinement, drape and tidiness. Feel free to scream, “NO!” if you disagree. After all, no matter what we think or like, we have no business without you, our beloved customers. 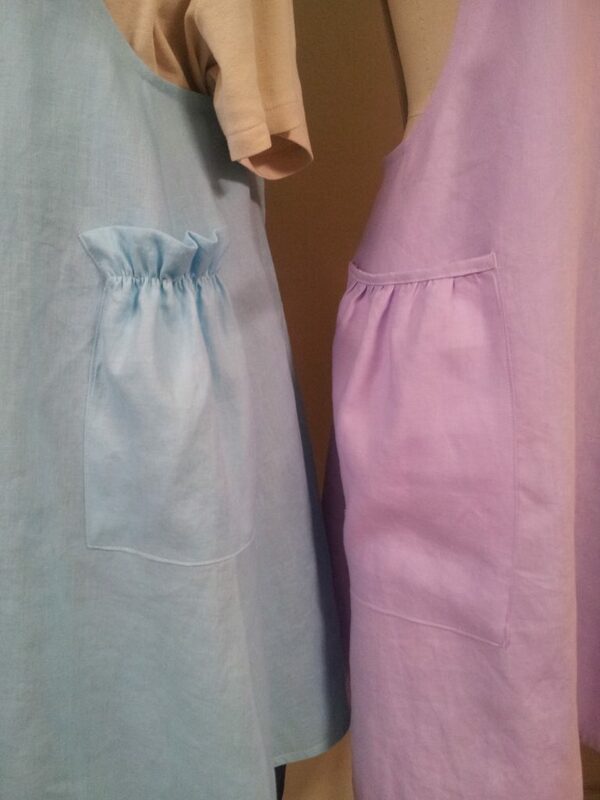 We will move to gathered top pockets for all linens until you tell us otherwise. All other aprons will stay with elastic ruffled pockets. 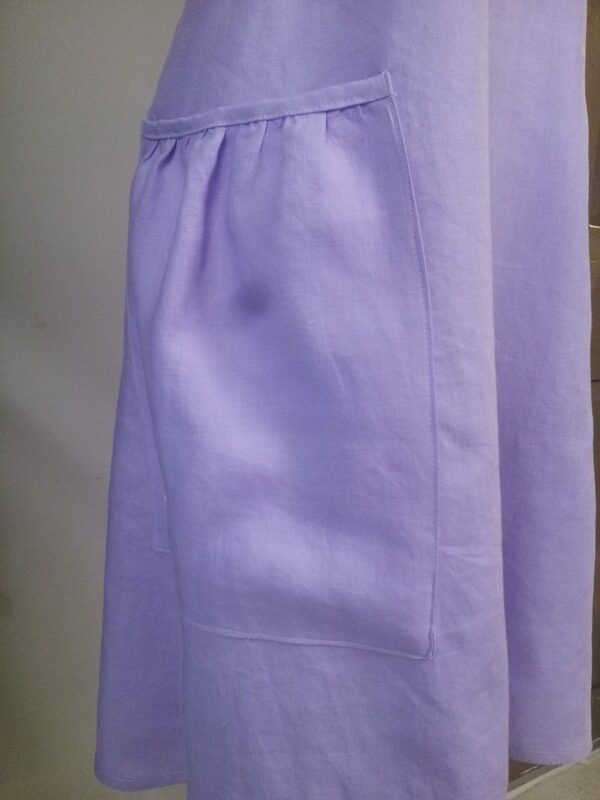 Love the lilac apron with binding and soft gathers on the pocket the best. The light blue pocket is too much for me. Only an opinion.